IT’S on again this Saturday... the Bushy Park Show, offering an enjoyable and relaxing day out for the family. The show will feature wood chopping and equestrian events as well as traditional cattle and sheep showing competitions including handler events. Sands Family Circus will again be putting on a performance and there will be working demonstrations including the traditional arts of blacksmithing, green wood furniture making and putting in a corner post assembly, as well as heritage plants and displays relating to honey and highland cattle to name a few. Bruce Press will be there with his snake pit and there will also be plenty of young animals for children to see thanks to the Jordan River Learning Federation School Farm. There will be traditional cattle and sheep judging and handling competition, a full equestrian program, mini-horse competition and, for the first time, alpaca fleece judging. Marie Bean, author of The Lazy Runner will talk about her approach to running and fitness. The Valley Taste section is back again, featuring Mavis Beattie demonstrating a very old recipe, the traditional hop and potato bread. 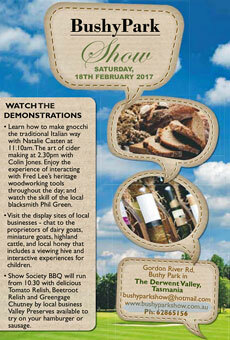 There will also be a butter making demo and two micro-brewers on site, both of whom use hops at Bushy Park. With the hops just about to be harvested, why not take a trip on the Lions Club Train which will depart all day from the showground, doing a short trip through the spectacular hopfields to the Text Kiln and return, for the cost of a gold coin donation. Other attractions will include the wood-chopping competition and the band Goodfellas performing from from midday. There will also be various stalls including food and beverages, while the traditional competitions of jams, preserves, home brewing and homecrafts will be on again. For the children, puppet shows will be performed several times during the day. In the afternoon, the second annual “Pollie Peel-off”will be held as local politicians compete against each other to peel the most potatoes in the fastest time under the scrutiny of a judge from the CWA. Can they beat the local police officer who won the first event last year? The Bushy Park Show will be held this Saturday, February 18, on the showground, Gordon River Rd, nestled among the hopfields beside the Styx River at Bushy Park, just 20 minutes northwest of New Norfolk via Glenora Rd or the Lyell Hwy. Visit the website for more information. Entry will cost $7 for adults and $3 for children aged 5-16. Accompanied children aged under five are admitted free and family entry costs $18 (up to two adults and three children).